Earlier this summer, long-time mobile software specialist DataViz brought its Documents to Go file viewing and editing app to the iPhone. The software is available in two editions—a $5 version that lets you view, edit and create Microsoft Word-formatted documents and a $10 edition that adds ability to send and receive file attachments through Microsoft Exchange. Does either version deliver the goods? And if so, which one is right for your needs? We take an in-depth look at both Documents to Go (Microsoft Word Editing & Desktop Sync) and Documents to Go with Exchange Attachments to see how they measure up on the iPhone and iPod touch. Editing a file is often hindered by the limits of workspace and physical tolerance for pain. This is why ergonomics is big business. And yet I once worked with a man who wrote an entire book about Hong Kong on a Palm Pilot with a keyboard attachment. It would have been a more impressive accomplishment had he done it without the keyboard, but writing and revising a manuscript on such a small screen couldn’t have been easy on the eyesight or the fingers. I can’t imagine my colleague repeating the feat on an iPhone or an iPod touch—at least, not without serious eyestrain and hellacious thumb cramping. But at least he would have the means of doing so with DataViz’s Documents To Go app. This $5 version of Documents To Go is a solid editing tool that lets you create and manipulate Microsoft Word files, as well as view a host of other file types, including Excel spreadsheets, PowerPoint slides, Apple iWork documents, PDFs and HTML. But it isn’t pain-free. 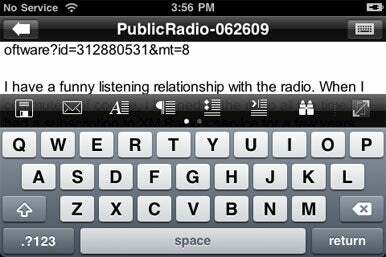 A Tight Fit: Typing in landscape mode on the iPhone or iPod touch may be easier, but in Documents to Go, it doesn’t leave you with a lot of room to work. Documents To Go allows users to perform the essential functions of Word: typing, cutting, pasting, formatting margins and type, find-and-replace searches, and predictive text entry. You can even work with tables and embedded graphics. You can also create Word documents on your handheld device and export them wirelessly to your desktop or laptop. The utility of such a program should be obvious to anyone who needs to do a lot of writing on the go but who may not always have access or use of their computer. The app is generally easy on the eyes. A pinch-zoom feature lets you easily increase and decrease the size of type, and the words wrap instantly to the screen. Working in the standard mode is ideal for viewing docs in this app. But if you find, as I do, that typing in landscape mode is easier than typing on the cramped standard screen, then DocsToGo presents an odd problem. Minus the menu and information bars, which the app lets you toggle off and on, you have at most three lines of screen to work with when the keyboard is up. That isn’t a deal breaker, but it does require some getting used to. It almost goes without saying that Documents To Go works best for Microsoft Word documents, but I’ll say it anyway. There are far superior PDF readers for the iPhone an iPod touch, notably Lexcycle’s mighty Stanza ( ). I opened a large PDF file in DocsToGo and found it neither particularly easy to read nor easy to browse. You cannot jump to a specific page, for example, which is kind of a bummer in a 376-page document. The app’s easy Wi-Fi synchronization is another selling point, albeit an imperfect one. Users simply install a desktop file management application and set their preferences. DocsToGo will manage folders or individual files. The app will sync with specific folders, as well as a convenient desktop drag-and-drop directory. And synchronization works both ways—you initiate from your computer or from your handheld. But Wi-Fi synchronization also presents an irritating drawback or two. Your handheld device needs to be on the same Wi-Fi network as your computer. You cannot sync with your desktop or laptop if you have a document open in the app (which is, admittedly, a minor complaint). Worst of all: If for some reason you find yourself working somewhere with temperamental or unreliable Wi-Fi (as happened to be the case when I was writing this review), you cannot sync your files. There really should be an option to sync when your handheld is tethered to a desktop or laptop. Why do so many developers fail to imagine a world—or even a circumstance—without Wi-Fi connectivity? The app is only fully functional with OS 3.0. Only then can you cut, copy and paste across other supported applications and send files with Gmail, Yahoo or other e-mail clients. And for the moment, Documents To Go (Microsoft Word Editing & Desktop Sync) doesn’t let users edit Excel files. But the developer promises on the app’s App Store page that an update to create and edit spreadsheets is coming eventually. Also, as we’ll see below, DataViz sells a different app that supports MS Exchange attachments. Documents To Go (Microsoft Word Editing & Desktop Sync) is compatible with any iPhone or iPod Touch running the iPhone 2.2 software update. With document viewers on the iPhone, you have to pick your tool carefully. Unlike older smartphones that really needed a doc viewer, the iPhone itself supports PDF documents, Word and Excel viewing, and image files sent by e-mail and that you find on the Web. Documents to Go with Exchange Attachments goes one step further, giving business professionals a way to not only view e-mail attachments sent over the Microsoft Exchange server—which is commonly used in business—but to edit Microsoft Word 2007 files. While it does not support Microsoft Excel editing—as with the Microsoft Word edition reviewed above, DataViz says there will be a free update this year— the $10 Documents To Go with Exchange Attachments works well and runs fast, with only a few important caveats. No Excel: Documents to Go supports Microsoft Exchange attachments for Word editing and doc viewing, but it does not support Excel files. Before we cover what’s missing, the good news for business workers who rely on Exchange as their e-mail messaging system is that this utility works as promised. I tested about 30 documents in many different formats, including about five different word processing formats such as Word 2003, RTF, and raw text. I also tested Apple iWorks docs for Keynote, Pages, and Numbers, and a handful of image files, PowerPoint docs, and PDFs. To view Exchange attachments, you just press the Attachments link. At this point, the interface for attachment viewing and editing is very easy to use—you’ll see a grayed out icon for files you have not downloaded yet. Once you do, you can then save them to a Local Files folder. There is very little delay between when someone sends you an e-mail over Exchange and when Documents To Go receives the file and makes the attachments available for viewing. Exchange support is a compelling addition to Documents To Go because of how the interface works for attachments. It’s easy to see which attachments are available, and which have already been downloaded, and then to view or edit them as needed. Interestingly, for a well-regarded tool with a loyal fan base, Documents To Go is actually not that flexible when it comes to other options for viewing and editing. The $13 Quickoffice Mobile Suite—which we’re testing for a separate review as this round-up was published—supports Excel file editing (albeit using the older 2003 version). It also lets you send an attachment from any e-mail account, using the files@quickofficeconnect.com account, and receive them on the iPhone. Quickoffice supports MobileMe public folders, and has a bit more a cutting-edge interface that is more Mac-like. For example, when editing Word files in Quickoffice, you can change text justification using a small preview overlay that uses drag-and-drop. I do prefer the Undo/Redo functionality in Documents To Go, however, There is a small icon that mirrors what you see in the desktop version of Word. (In Quickoffice, you shake the phone to perform an undo, but there is no button to press.) For syncing files, Documents To Go uses Bonjour; I tested about 250MB worth of files and it only took four minutes to deliver them over Wi-Fi. For editing Word files and viewing Exchange attachments, I’d prefer to see a bit more iPhone-friendly functionality—e.g., a double-tap to see a photo at normal size, or maybe a shake feature to go to the next document in your folder list. In formatting text for Word files, the toolbars are easy to use, but some users might not notice that you can pan to the right for additional options, such as paragraph justification. There is an option to see the word count of a Word document, a feature missing from Quickoffice. Helpfully, Documents To Go also warns you when attachments are quite large and will take a while to download and view. 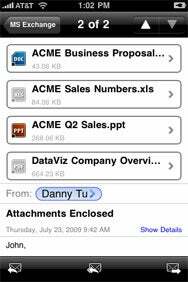 Documents to Go with Exchange Attachments is compatible with any iPhone or iPod touch running the iPhone 2.2 software update.